POTSDAM -- Potsdam Village Superintendent of Public Works Jim Corbett said it’s possible that the size and number of potholes this spring – seemingly larger and more numerous – could be due to the cold-warm-cold oscillations this past winter, but there’s not much his crews can do before the temperatures rise well above freezing and stay there. 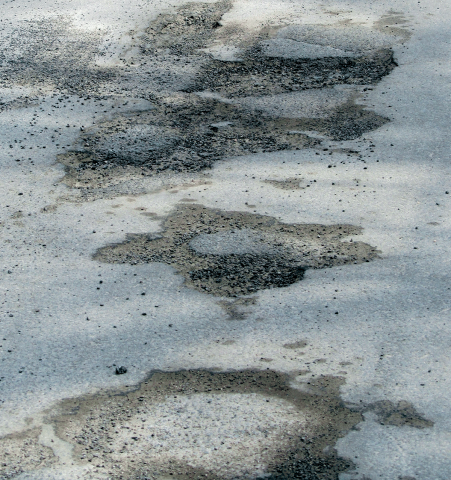 “It has been a bit worse this year” than the average pothole season, Corbett said. “I don’t like hitting a pothole any more than anybody else does,” he said. Town Highway Superintendent John Keleher agrees. “We’re seeing it everywhere this year. When it goes from 60 during the day to 20 at night, that’s not good,” Keleher said. The usual first fix for potholes while it’s still cold is temporary “cold patch” – just stone and oil – but that might not hold up for long. “It works if you have good conditions and it’s dry, but we haven’t had that,” Keleher said. When we spoke with Corbett he had already used most of the 75 tons of the cold patch the village had on hand. He said the village streets are not in as bad a shape as the state roads in Potsdam, “and they’re responsible for that, but the state doesn’t do a lot” of the early patching and filling while it’s still cold. To begin filling holes with the more permanent fix, temperatures have to be well above freezing and likely to stay there for a while. Both Corbett and Keleher said they would prefer to do it when temperatures reach 50 degrees or higher. “The hotter the better,” Keleher said. The “hot patch’ – asphalt or blacktop that comes in several different grades – is used for general paving and pothole work. Municipalities in St. Lawrence County have been waiting to hear who will be supplying those materials this year through a county contract. Keleher said the annual contract was won by Barrett Paving Materials Inc. of Norwood, beating out J.E. Sheehan Contracting of Potsdam and a couple of other bidders. The contract covers a variety of materials that the county can order for themselves and local municipalities to use, from Type 1 base, a rougher material, up through binders, tops, and “Superpave” paving mix. The bid prices are calculated to submit bids in March, but prices can rise month by month, and they have already, Keleher said. He said he believes the increases can coincide with rises in the price of oil, a major component of the materials, but “I have never seen it go down” even if the oil price decreases, he said. The actual annual road paving plans that municipalities have in place by this time of year are a little murkier this year, with fewer state aid dollars available in the new Albany budget. Superintendents have plans for what they believe they can spend, but Keleher says he is hopeful that there will be a June budget review where the governor and state lawmakers can juggle some figures and maybe come up with more funds for local roads.